Dry sandy forests, oak (and jack pine) savanna; sandy banks, fields, dunes, and fencerows; roadsides and railroad embankments; borders of forests; occasionally in moist ground. A common variable species. A few plants lack the gland-tipped bristles on hypanthium and pedicel, but can be placed here by the slender, straight, usually terete prickles. From R. acicularis they also differ in range and in usually singly serrate margins of the leaflets, and from R. palustris f. inermis in the more coarsely serrate leaflets as well as habitat. 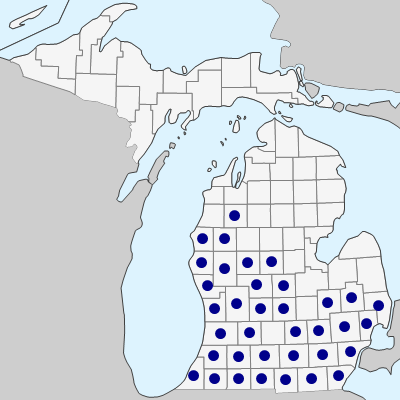 Lewis (2008) noted two subspecies in Michigan, the widespread eastern subspecies carolina and the more western subspecies subserrulata (Rydb.) W. H. Lewis, which differs in having internodal prickles ± densely covering the branches. MICHIGAN FLORA ONLINE. A. A. Reznicek, E. G. Voss, & B. S. Walters. February 2011. University of Michigan. Web. 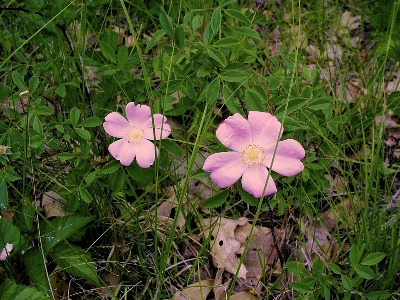 April 19, 2019. https://michiganflora.net/species.aspx?id=2539.